US President Barack Obama confirmed plans to dramatically increase the American troop presence in Syria by deploying an additional 250 personnel, bringing the total to 300. He said the troops would help drive out the Islamic State terrorist group. “Just as I have approved additional support for Iraqi forces against ISIL (Islamic State, previously ISIS/ISIL – RT), I’ve decided to increase US support for local forces fighting ISIL in Syria,” Obama said. It was not immediately clear how many of those 250 troops would be added to special operations, medical or intelligence support. According to Obama, they will be involved in special operations as well as in training and assisting Syrian opposition forces to fight IS. Speaking in Hannover, Germany, Obama said NATO members can and should do more to fight Islamic State. “In Syria and Iraq we need more nations contributing to their campaign. We need more nations contributing trainers to help build up local forces in Iraq. We need more nations to contribute economic assistance to Iraq so it can stabilise liberated areas and break the cycle of violent extremism so that ISIL cannot come back,” he said. Obama is visiting Germany to discuss various foreign policy issues, including Syria, Ukraine, Libya and the controversial Trans-Atlantic Trade and Investment Partnership (TTIP) deal. He is meeting top European officials, including German Chancellor Angela Merkel, British Prime Minister David Cameron, French President Francois Hollande and Italian Prime Minister Matteo Renzi. The first time Obama broke his 2013 promise of no “American boots on the ground in Syria” was when he sent 50 US special operations forces to Syria last year, claiming the move as a “counterterrorism” measure and not a step closer to a ground invasion. Obama won the presidency first time around in 2008 by pledging to bring peace to the Middle East. However, in recent years, decisions were made to keep adding US troops in the region to help control numerous conflicts. Obama’s decision to boost the number of American troops on the ground in Syria brings up issues concerning the previous failures of the US train and equip program that dealt with unreliable opposition fighters. The Pentagon gave up on the training part of the project in October, after senior Obama administration officials admitted that the US had only trained a handful of fighters, despite the program’s $500 million budget. Moreover, it was revealed in September that one group of trainees had surrendered one quarter of their US-supplied weapons, ammunition, and vehicles in exchange for safe passage through territory held by another rebel group affiliated with Al-Qaeda. 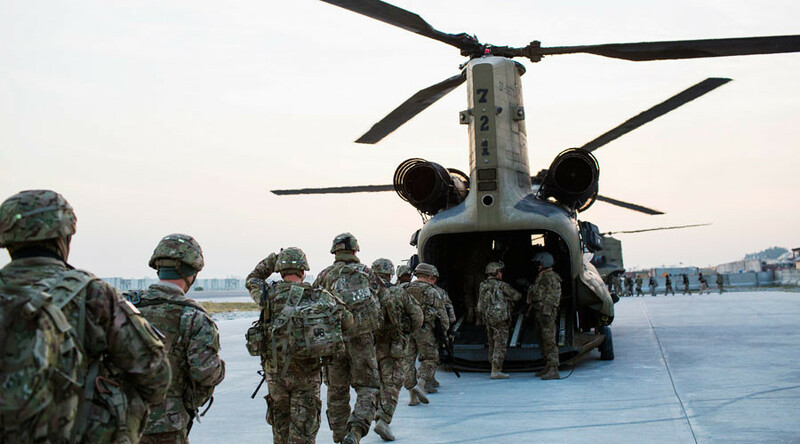 In addition to more troops in Syria, the Pentagon announced last week that 217 additional military personnel and Apache helicopters will be sent to Iraq, largely in an advisory capacity, on how to fight Islamic State. The additional troops will bring US troop levels in Iraq to 4,087. The US-led coalition has been carrying out airstrikes against IS in Iraq and Syria since mid-2014. However, the US involvement in Syria began without the approval of the Syrian government of President Bashar Assad.